Kunchikal Falls is located Nidagodu village near Masthikatte in Shimoga district of state Karnataka.Kunchikal falls cascades down rocky boulders and total height of fall is 455 meters (1493 feet) according to world waterfall database. Kunchikal falls is formed by Varahi river. After construction of Mani Dam near Masthikatte and underground power generation station near Hulikal, Shimoga district, the water flow to this falls is greatly reduced and visible only during rainy season (July-Sept). As the falls is within restricted area, Gate pass is required to visit and the pass is being issued at Hosangadi village (about 15 km away). 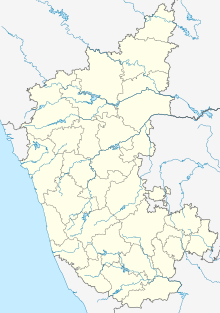 The nearest Airport is at Mangalore, situated 138 km (86 mi) from Kunchikal Falls. ^ "Top 10 Highest Waterfalls In India". Jagranjosh.com. 25 July 2017. Retrieved 2 October 2018. ^ Husain, Majid (1978). Geography Of India. New Delhi: Tata McGraw-Hill Education. p. 3.47. ISBN 978-1-259-00089-8. ^ "Tallest and Largest Waterfalls at the World Waterfall Database". Worldwaterfalldatabase.com. Retrieved 2 October 2018. ^ a b "Varahi Hydro Electric Project". Karnataka Power Corporation Limited. Archived from the original on 2012-11-29. Retrieved 2012-08-03. ^ "138 Km - Distance from Mangalore to Kunchikal Falls". DistancesFrom. Retrieved 7 October 2017. This article related to a location in Shimoga district, Karnataka, India is a stub. You can help Wikipedia by expanding it.